Ho Diocese is located in the Volta Region of Ghana and constitutes ten Administrative Districts, namely: Ho, Kpando and Hohoe municipal areas. Others include, North Dayi, South Dayi, Adaklu, Agortime-Ziope, Ho-West, Afadjato-South Districts and parts of Asuogyaman District in the Eastern Region. The Diocese lies within longitudes 12'E and 0 53'E; and latitudes 6 20'N. The Jasikan District lies in the North of the Ho Diocese while it is bordered in the East by the Republic of Togo. The Southern border is shared with Akatsi and North Tongu Districts while the Volta Lake forms the Western boundary. Ho Diocese covers a total land area of 5893 square kilometers. It is divided into twenty-nine Parishes. Your Eminence Peter Cardinal Kodwo Appiah Turkson, President of the Pontifical Council for Justice and Peace, Most Rev. Jean Marie Speich, Apostolic Nuncio to Ghana, Most Rev. Archbishops and Bishops, Superiors of various Institutes of Consecrated Life, members of the Council of State, honourable members of parliament and ministers, the Paramount Chief of the Asogli State and President of the Volta Regional House of Chiefs, (the Awormefia of the Anlo State), Mamaga of the Anlo State, Togbiwo, Mamawo, priests, consecrated men and women, pastors of the different Christian confessions, the media, brothers and sisters in Christ, all people of good will and my beloved faithful of the Catholic Diocese of Ho, I say peace be with you. 14th July 2015 marked a significant change in my life. On that day, it was announced that the Holy Father, Pope Francis has elected me Bishop of the Catholic Diocese of Ho. Since then I continue to ask myself a question that no one has been able to help me answer adequately – Why me?As I already said on a different occasion, least did I dream that one day I will be called to shepherd the faithful in the Catholic Diocese of Ho. The shock of the election prevails and I continue to say that I accepted this election in religious obedience to the Holy Father, Pope Francis. Having vowed obedience to God and to my superiors in the Society of the Divine Word and to the Church, I accept this ministry as a missionary of the Church and I thank the Holy Father, Pope Francis for such an honour done to me, an unworthy servant of the Church. Your Eminence Peter Cardinal Kodwo Appiah Turkson, President of the Pontifical Council for Justice and Peace,I thank you for willingly accepting the invitation to be my principal consecrator. Despite your tight programme of activities in Rome and abroad, you decided to reschedule some of your activities so that you can be here with us today for my episcopal ordination. We hold you in high esteem and promise to continue to lift you up to the Lord in prayer that he may continue to richly bless you in your ministry for the universal church. To my co-consecrators, Most Rev. Jean-Marie Speich, Apostolic Nuncio to Ghana and Most Rev. Francis Anani Kofi Lodonu, Bishop Emeritus, Ho as well as the preacher for the day, Most Rev Charles Gabriel Palmer-Buckle, Metropolitan Archbishop of Accra, I would like to express my gratitude to each one of you for accepting your respective tasks in this ordination ceremony. I would like to take this opportunity to congratulate my predecessor Bishop Emeritus Francis Anani Kofi Lodonu for shepherding the flock of the Keta-Ho Diocese and then the Ho Diocese for almost four decades. Your tireless efforts and guidance have brought the Diocese of Ho to its present status. The fruits of your labour bear witness to your distinguished and competent leadership. There will be an occasion in the very near future for all of us in the Diocese of Ho to express our gratitude to you in a befitting manner. I would like to take this opportunity to thank all my brother bishops who are here today, not only from Ghana but also from Togo, my first mission country from 1986 to 1996. I thank you for your presence here today and count on your brotherly support in carrying out the ministry entrusted to me. Allow me to make particular mention of some bishops who travelled from other countries to be part of this celebration –Most Rev. Andrew Karnley,Bishop of Cape Palmas, Liberia, Most Rev. AntónioJaca, SVD, Bishop of Caxito and Bishop ZeferinoZeca Martins, SVD, Auxiliary Bishop of Luanda - who came all the way from Angola as well as Bishop Frank AteseNubuasah, SVD of the Vicariate of Francistown, Botswana who is a son of this diocese. I would also like to acknowledge the presence of the members of the Arnoldus family – the SVDs and SSpS - from Ghana, Togo and Benin. I believe the SSpSAP in Lome are united with us in prayer today. Thank you for your presence and fraternal support. Remember you have a brother here in Ho and please come and check on him from time to time. A special word of thanks to Fr. Robert Kisala, the Vice Superior General of the Society of the Divine Word, who came from Rome, Italy to represent the worldwide SVD family and in a special way Fr. Antonio Pernia, the former Superior General of the Society of the Divine Word, who came all the way from the Philippines for this occasion. I thank both of you personally for what you have been for me in the last nine years and especially for the opportunity to experience religious administration at the Generalate level. I am very grateful to all the priests and consecrated men and women who travelled from the length and breadth of Ghana, Togo and Nigeria to be part of this celebration. May the good Lord reward you abundantly for your care and concern. I also thank all of you - members of the Council of State, honourable members of parliament and ministers, the Paramount Chief of the Asogli State and President of the Volta Regional House of Chiefs, (the Awormefia of the Anlo State), Mamaga of the Anlo State, Togbiwo, Mamawo, pastors of the different Christian confessions, Christian faithful, friends and relatives from different parts of Ghana and Togo for responding to the invitation to come and pray with me today. May the Lord reward you abundantly for your generosity. Last but not the least, I would like to express my gratitude to my dear people of the Ho Diocese which is henceforth my home. I thank you for the warm reception yesterday afternoon and the moment of prayer and benediction in the Sacred Heart Cathedral. I thank each and every one of you who has been part of the preparation for this memorable day. Without your support, dedication and hard work, the ceremony would have been a failure. I implore you to keep up your spirit of hospitality and collaboration so that together we may build up the kingdom of God in our corner of the vineyard of the Lord. I conclude with a request to all of you to continue to pray for me so that I may faithfully carry out the ministry entrusted to me in the Diocese of Ho. Together let us pray that like the two disciples of Emmaus, the Lord may remain with us (Luke 24:29). Let us remember that “if the Lord does not build a house, in vain do its builders toil. If the Lord does not guard a city in vain does its guard keep watch” (Psalm. 127:1). May the peace and the light of Christ be with all of you and once again thank you all for your prayers and for coming to this celebration. On July 14, 2015, The Holy Father appointed Rev. Fr. 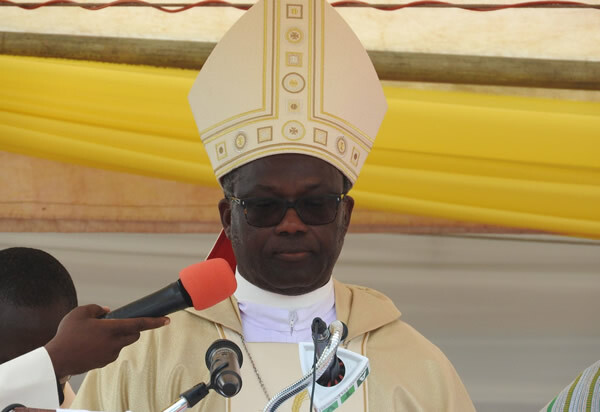 Emmanuel Fianu, S.V.D., Secretary General of the Council of the Divine Word Fathers as Bishop of Ho (Ghana).